The 10,000 Degrees Institute is a college success program that focuses on supporting seniors from low income backgrounds to matriculate to and through college. We firmly believe in supporting students in reaching their full potential regardless of race, ethnicity, gender, documentation status, or socioeconomic background. We do not have a GPA requirement. Students begin their participation in the program through a two day, one night Summer Intensive experience at a local college campus. Students gain exposure to the college process through a series of workshops and cohort bonding activities. Students will experience life as a college student, live with a roommate, and be empowered with the resources to explore, choose, and pay for college. This year’s 10,000 Degrees Summer Intensive will be held in seven separate overnight sessions from July 22 – August 2. 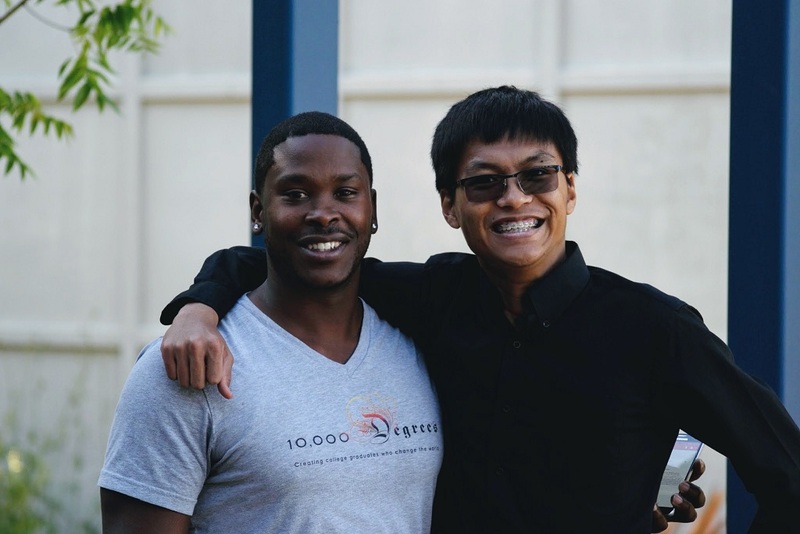 After the Summer Intensive, students are paired with a 10,000 Degrees Fellow who will work with them in achieving the necessary steps for the college process. Students are expected to attend weekly meetings where they focus on matriculation steps such as completing college applications and financial aid. Once students begin their college careers, they will continue to be part of the 10,000 Degrees program until they successfully graduate. Which of the following phone numbers can you provide? Which of the following do you want to share? What are you gender pronouns? Are you (or a sibling) the first in your family to pursue college? Please select... Yes No I don't know Please answer "Yes" if your parents attended college but have not attained a Bachelor's degree or higher. What academic or college access programs are you involved in or plan to apply to? What other program are you involved in? Do you normally speak a language other than English at home? Do you have a sibling that participated in the 10,000 Degrees Institute? From which high school will you graduate? From what high school will you graduate? Thank you for your interest in the 10,000 Degrees Institute! This program is just for current high school juniors. Based on your response to "What year will you graduate from high school?" above, you are not eligible to apply. Feel free to review the eligibility requirements for our scholarship program as you may be able to apply to that instead and still receive support from 10,000 Degrees. Please reach out if you have any questions! This program is just for current high school juniors. Based on your response to "What year will you graduate from high school?" above, you are not yet eligible to apply. Return to the 10,000 Degrees website in your junior year to apply. Please reach out if you have any questions! This program is just for current high school juniors at certain high schools in Marin and Sonoma County. Based on your response to "From which high school will you graduate?" above, you might not be eligible to apply. We will review your application and get back to you about whether we work with students at your school! When you were 13 years old or older, were you in Foster Care? When you were 13 years or older, were both your parents deceased? Are you or were you in a legal guardianship (not your biological or adopted parents)? Are there other circumstances within the last year that make it very difficult or impossible to provide parental information? Select "Yes" for more options. Note that these are less common and responses are completely confidential. Within the last year, were you an unaccompanied youth who was homeless OR were self-supporting and at risk of being homeless? Do you now have or will you have children who will receive more than half of their support from you before graduating high school? Has it been determined by the state of California that you are an emancipated minor? The next page will request information about one or both of your parents. Select "Yes" to continue. Yes, I will fill in information about one or both of my biological or adoptive parents. The next page requests information about your primary caretaker, which may be either a Foster Parent or Legal Guardian. According to how you answered the above questions, you will fill in this information and not information about biological or adopted parents. Select "Yes" to continue or correct your answers above. Yes, I will provide information about foster parent(s) or legal guardian(s). You must provide information for at least one parent. This can be completed by the parent with whom the applicant lives with the majority of the time. How many in the household will be attending college/university in 2019 - 2020 (not including parents)? What is the relationship to the applicant? For parents’ financial information, please use your 2017 or 2018 tax return (1040, 1040A, 1040EZ). If you did not file taxes for 2017 or 2018, please follow instructions. You may also use your W-2 form or most recent pay stub. This information is strictly confidential and for our use only. If you need assistance completing this section, please call us at 415.524.3731. If you filed taxes for 2017 or 2018 refer to form 1040: Line 37; 1040A: Line 21; 1040EZ: Line 4. If you did not file taxes for 2017 or 2018, enter your estimated total wages earned from work in year 2017 or 2018. If you filed taxes for 2017 or 2018refer to form 1040: Line 56; 1040A: Line 37; 1040EZ: Line 10. If you did not file taxes for 2017 or 2018, enter 0. Include current amounts in cash, checking, savings, real estate besides your primary residence, net worth of stocks and bonds, trust funds, mutual funds. What is your motivation to go to college? What was a situation in your life when your determination or perseverance helped you to achieve a goal? I certify that the information in this application is true and accurate. I understand that my application may be denied or withdrawn if it is not submitted by the deadline, incomplete or if any information reported on this application is found to be intentionally misleading, inaccurate, or fraudulent. The following essay consists of my original thoughts and ideas, and is not plagiarized in any way.